In an intro to the last post, I mentioned the importance of learning to individualize your training for more auspicious results. Now, this is not directed at anyone who has been training for less than five years. It behooves more experienced lifters, however, to better understand and gauge their responses to the training stress with a non-linear form of variable intensity training modification. Hahaha! Got ya there, didn't I. You figured I was gonna carry on writing like one of those faux-intellectual research-based stooges. Okay, let's get serious now and start over. Look, I understand that a lot of you see a high volume or high intensity or high frequency or high volume/high frequency/high intensity layout from a magazine and immediately write it off as BS ghostwritten in a half-hour by some staff writer trying to pay the rent. Think again before you throw it all away. "Baby please, don't walk out that door." There are times when a high volume approach will work for you. Times when a low volume approach will. Times when a high volume/high frequency/high intensity approach will. And, of course, times when nothing will work for you. No foolin' . . . it happens to everyone who refuses to simply "up the dose" in response to a plateau. Do people like that still exist? I wouldn't know, but do hope so a little. Thing is, just because something looks like it's too much for you, or possibly too little for you to gain on, you won't know until you try it out at an appropriate time. It's always amazing to find how big a workload some people can progress with at certain times in their lifting life . . . and equally amazing to realize how little some people can do at times and still progress. Consider also that all the varying degrees and shades of life and death are fluid, in partial transition at all times, shifting like a mother from this to that and back to this again unbeknownst to most. Hey, I'm just shittin' ya! Let's carry on with the certainty that we know and see reality as it fully is in this one popularly held to be true view or ours. There. Isn't that just so much better! Be open-minded when reading training info. Really. Try things out. Learn to know yourself better than you know that know-it-all who keeps telling you what to do at the gym or through all those sales emails. Recommendations are wonderful, of course! But you're missing out on one of the greatest parts of lifting beyond the first half-decade or so mark if you aren't learning to see the individual you are much, much more clearly. To most people -- even some bodybuilders -- the term "big arms" has a connotation of bulging biceps and nothing more. In actuality, though, the triceps -- that three-headed muscle mass located on the back of the upper arm -- comprises two-thirds of the total girth of this appendage. Obviously, then, any gain in the triceps will dramatically improve the arm's general appearance. 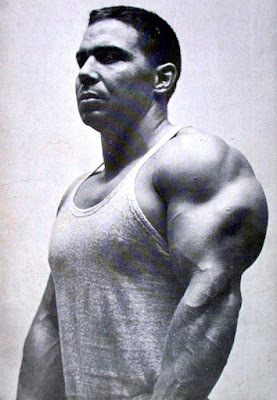 If you want to see a prime example of outstanding triceps development, study the pictures of Bill Pearl. You will note that the back of his arm resembles the shape of a horseshoe (for a large horse! ), a sure sign of a well-formed triceps. Although the triceps receive plenty of stimulation from all of the pressing exercises that are included in a typical bodybuilding routine, specific movements are needed to accentuate this muscle group. The exercises that I have found for myself to best build size and shape are the bench press, incline press, seated press, dumbbell press, press behind neck, triceps pressdown, dumbbell kickback, and one-arm pulley pressdown. When training for a peak, I train my triceps three times each week, usually after heavy pressing exercises (see above). On occasions I do alternate (superset) sets of biceps and triceps movements. I start my routine with pressdowns on the lat machine. This is an excellent movement for building up and shaping the inner and outer triceps heads. I do five sets of 12, working up in 10-lb increases. Make sure you perform this one strictly. I've found that the triceps are particularly vulnerable to injury when they are placed in an awkward position and great stress is applied, so by careful. I do pressdowns with my elbows fixed solidly at my sides and make sure to fully extend and contract the triceps on every rep.
100 x 10 x 3 sets. Here again the injury factor must be considered. Warm up thoroughly. Add weight slowly, slower than you think you should, and allow your triceps and elbows to become accustomed. Next I do dumbbell kickbacks. Usually 6 x 10 working up in 5 lb jumps. After these I perform one set of cable pressdowns or extensions to flush the muscles. You will notice that moderate poundages are being used in these triceps exercises. After several sets of heavy presses, the object is to bring blood to the triceps and pump them up.